If you have multiple smaller kitchen appliances you probably have a hard time finding space for all of them. One of the most commonly used small kitchen appliances is the Kitchen Aid stand mixer. This appliance has become extremely popular over the past couple of years. There are many different ways you can store and hide this mixer so it is not always sitting out in the open on your counters. One way to store your mixer is to install the hideaway shelf. This conveniently pulls out of a cabinet and can hold the weight of the mixer and other bowls. 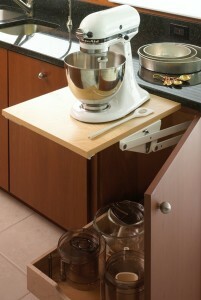 It locks into place to ensure proper mixing without falling back into the cabinet. These can be installed in different sizes to accommodate the style and size of your kitchen cabinets. This is a great way to store your mixer because you can easily bring it out to whip up some cookie batter and put it back into the cabinet immediately after you are done. A couple other appliances that are commonly used are a microwave and toaster. There are hideaway rolling cabinet doors that are easy to use and install. These will pull out and cover an entire cabinet space then roll back to look like they were never there. In this cabinet you can hide your microwave, toaster and your Kitchen Aid mixer in the same area. This makes it very easy to clean up your kitchen when you have company or a get together. You can keep these appliances hidden behind the rolling cabinet door until you need to use them. If you put multiple shelves in this cabinet you can even store the accessories for these appliances. Some people use a larger blender to make smoothies and salad dressings. These blenders can become a hassle to move around if they are left sitting on your kitchen counters. This goes the same for a tea pot or even a pitcher. There is a very simple and stylish way to keep these products stored so they are not in the way of your everyday activities in the kitchen. Using one of the cabinets under the counter, you can install what looks like dishwasher drawers. These can be pulled out and can store multiple items next to each other without worrying about the wood drawers or cabinets getting wet. Keeping these items together is a great idea to keep your kitchen well organized so you know exactly where every item is kept. A dream kitchen will include all of these appliances but in spaces where you cannot see them. The trick is to make your kitchen look spotless and organized while you are not cooking. Your kitchen will then look well used and fully equipped when it comes time to prepare a meal or bake some cookies. You will have your guests excited and intrigued when you whip these appliances out of their hiding spots.